I don't often allow patterned paper to take centre stage of my cards, but I was so taken with Chriss' geometric paper and how important a role it plays in the feeling of her card, that I decided to give it a try. I found this old marbled paper in my stash (I think from the Japanese paper shop) and I love how it has almost-Christmas tree shapes in the pattern. That paper is gorgeous and it totally has the feel of Christmas trees. Love this!! Wow! What a fantastic card. I love the marble paper - it really is the star and has tree shapes in it!! Love it! Love that paper, Ardyth, and the gold with it keeps it a simple yet stunning card. For a minute there I thought I clicked on the wrong blog! This is fabulous...and yes, the paper definitely has a Christmas tree look! The gold looks great! 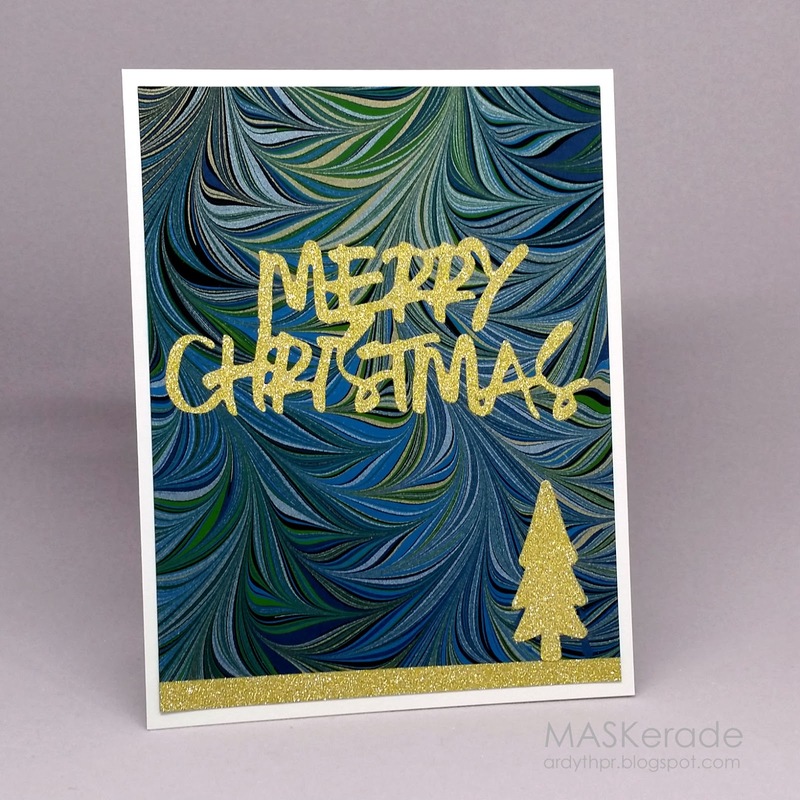 The patterned paper is so special - it's a beautiful background for the sentiment die. I love how you used this beautiful paper as your inspiration! Lovely organic movement and I bet it has some gorgeous texture, too! OH! That paper! And perfect with the gold tree and sentiment to pull out the gold in the design. WOW Ardyth, that paper is stunning and your card is really lovely...just love it. Love this Ardyth, the paper is a perfect setting for the die cut and christmas tree. WOW, love this such an awesome paper! Stunning card Ardyth...love that background, it looks amazing with all the gold. Oh what pretty paper! This is wonderful!! Beautiful! Congrats on stepping out of your comfort zone because that paper is gorgeous! I see the trees too!